The University of Southampton commissioned Studio Four Architects to develop proposals to convert a former seminar room on the west side of Winchester School of Art into three smaller seminar rooms for between 24 to 30 people each. 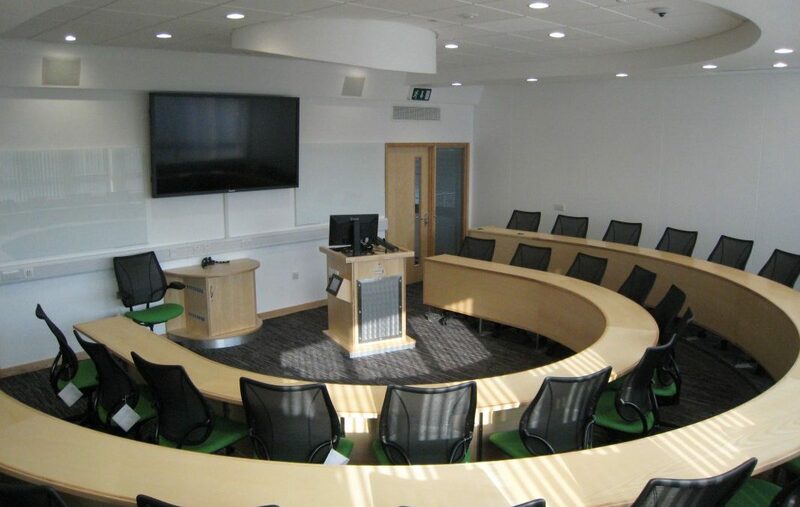 The design proposal consisted of stripping out the old seminar room and reconfiguring the space with three new smaller seminar rooms with improved ventilation, lighting, acoustics and IT. A small “interview” room was also included and all rooms were linked by a corridor with new fire exit doors. Each seminar room has the latest audio visual equipment. On the east side, we developed proposals to fit out another room into a “Harvard” style seminar room. The design proposal for this new room included two rows of tiered “horse shoe” format seating for 34 people, as well as improved mechanical ventilation, heating, lighting, acoustics, IT and the latest audio visual equipment. The corridor is used for “meet and greet” and incorporates a beverage area and easy seating. The refurbishment was completed in August 2014. A Design & Build contract with Dean & Dyball, Studio Four developed the design and production drawing package during the construction phase.